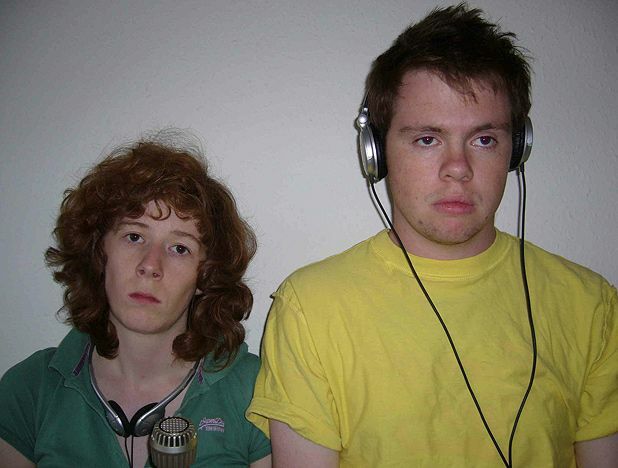 Like a sort of sarcastic, deadpan orphan Annie, Helen Cripps and her comedy partner Alex Nash show real potential in this mini-comedy drama about a village radio show. Utterly crap phone-ins and jingles, not to mention visual gags and ‘I Saw You’ notices – which lose the fundamental element of anonymity in a village of only ten people – make for very dire radio, but a clever backdrop for their cast of characters. Nash does a good job of acting dopey, and is incensed when Cripps points out he is basically ‘chumless’ apart from her. ‘I have a glut of chums. A surfeit, a backlog of chums,’ he protests, totally unconvincingly. The Cambridge Footlights graduates’ humour leans towards the stupid, and sometimes surreal end of the spectrum, with some amusing British observational stuff about Polish handymen ‘factotums’ and rural, Northern coupledom. A few jokes fall flat, and some of their friendly abuse is hit and miss or dragged out too long, but overall, this is a road that is bound to take the real life Alex and Helen somewhere good. The Caves, 208 0882, until 30 Aug, 3pm, £8.50 (£7.50). Alex and Helen have ideas above their (radio) station. They make a show only ten people hear. That's only nineteen ears mind; Malcolm's missing one. Alex Nash and Helen Cripps present a comedy about communication.